Our bathroom would be done if it weren't for the hundred or so little annoyances. 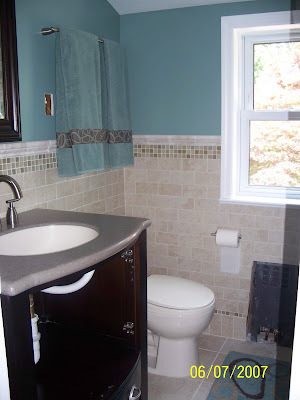 We can now use the tub and shower. 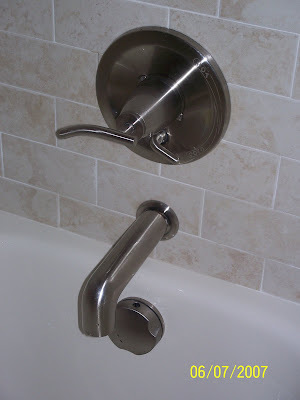 But, I think the water handle is backwards... it shouldn't be pointing left... it should go right. The words hot and cold are on the right. The handle should point towards them correct? (like they did yesterday before it was "done" and like in the picture on the box) Also the way it is now Zoe can just easily pull down and it turns on. Before she tried but it had to be pushed up to turn on, so she gave up. Also, once the handle fixture was in it pulled and forced the faucet forward... now there is a space between the faucet and wall. Isreal already said he has to get a shorter pipe for the faucet. Tomorrow I have to ask if he can adjust the handle too. But it works (and it's pretty). Still no drain, but I'm happy to use the little rubber stopper I found at Target for now. 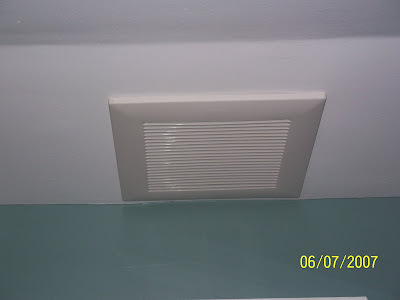 Isreal finished painting the ceiling to his satisfaction and he put the cover on the exhaust fan. No problems here! Yeah! It is so quiet. Fabulous. 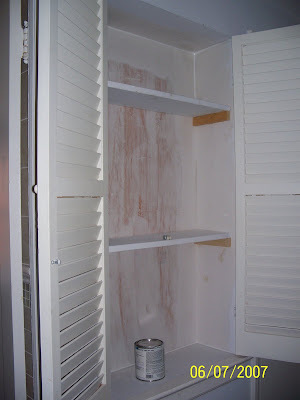 The closet is done except for paint. The spackle will dry tonight, and paint will be done tomorrow. 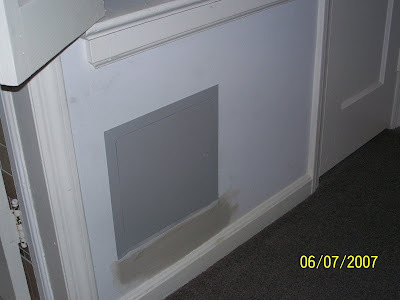 The Zoe-sized hole that was in the wall to access the plumbing now has an access panel door. 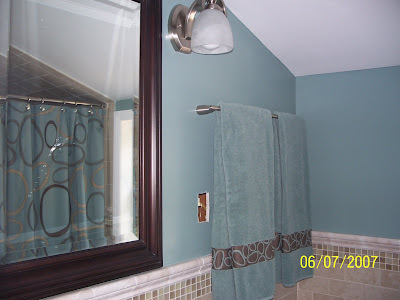 Again, once the spackle dries the wall and panel will be painted the wall color so it will just blend in. And here it is... what you've all been waiting for (almost)!